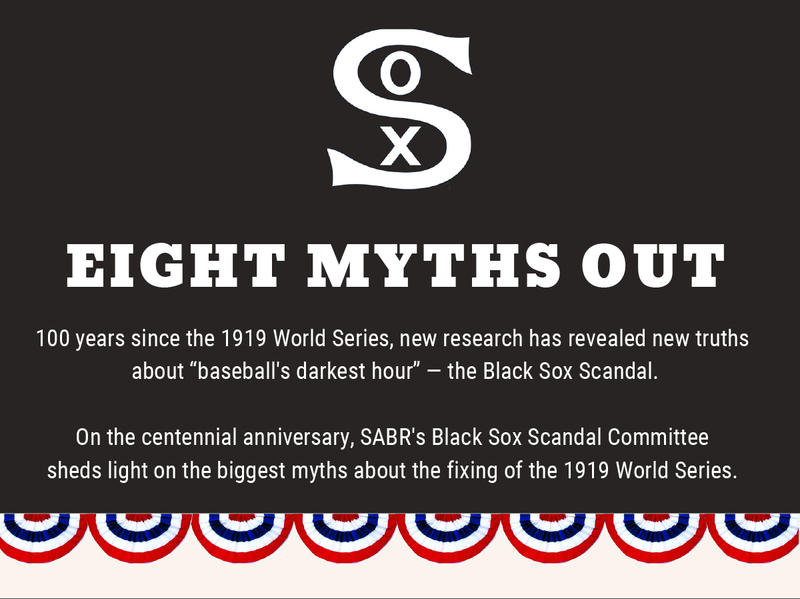 MARCH 19, 2019 — One hundred years after the fixing of the notorious 1919 World Series, SABR's Black Sox Scandal Research Committee is shedding new light on baseball's darkest hour. The Black Sox Scandal is a cold case, not a closed case; new evidence has been discovered in recent years that has enhanced our collective knowledge of the scandal. Since the publication of Eliot Asinof's Eight Men Out in 1963 and the John Sayles film by the same name in 1988, the dramatic story of underpaid and undereducated Chicago White Sox ballplayers, disgruntled by their low pay and poor treatment by management, who fell prey to the wiles of double-crossing gamblers has been thoroughly debunked. Much of the popular narrative about the Black Sox Scandal falls apart under closer scrutiny. SABR's Eight Myths Out project, which launches today at SABR.org/eight-myths-out, is intended to correct many common errors and misconceptions about the fixing of the 1919 World Series. The project, a collaborative work produced by members of SABR's Black Sox Scandal Research Committee, uses groundbreaking research and resources to provide a more complete understanding of what happened a century ago. These new pieces to the puzzle have provided definitive answers to some old Black Sox mysteries and raised other questions in their place. In addition, we've compiled an extensive list of historical inaccuracies, large and small, that appear in Eight Men Out, with links to articles, artifacts, and other resources that are now available online. This includes accurate player and team salary information from the 1919 season, legal documents and transcripts from the Black Sox grand jury proceedings and criminal trial, hundreds of interviews with players from the Chicago White Sox and Cincinnati Reds, and newsreel film footage from the 1919 World Series games. The Black Sox Scandal continues to play a relevant role in sports and offers important lessons for the 21st century, as Major League Baseball begins to re-open its doors to legalized betting 100 years later. We hope the Eight Myths Out guide inspires you to dig deeper and learn more about the 1919 World Series. It’s a story that continues to fascinate baseball fans, writers, and researchers all over the world. One hundred years after the 1919 World Series, we're still learning more about the Black Sox Scandal. To view SABR's Eight Myths Out project online, visit SABR.org/eight-myths-out. This page was last updated March 19, 2019 at 12:39 am MST.